When I first entered Table 21 a feeling of déjà vu settled over me. The restaurant was certainly new, I’ve never dined there before, but the dining room looked so familiar. Thankfully, almost all my meals are well documented on Gastro World, so upon looking up the west end Toronto restaurants, I realize Table 21 replaced Stratosphere Gastrolounge, and with it the menu has gone from upscale pub fare to stick-to-your-ribs Italian. With heavier mains, my husband and I both decided to stick with salads to start. 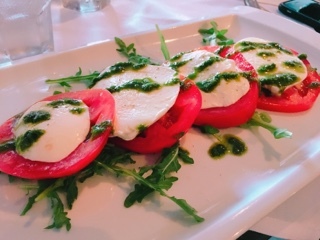 The caprese ($12) was simple but used fresh ingredients: the beef steak tomato was juicy and ripe, the mozzarella cheese fresh so it had a nice soft chewiness, and there was just enough pesto to add interest to the salad. 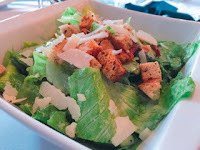 While the Caesar ($10) had a light coating of dressing, don’t let the lack of cream sauce fool you; the salad was still flavourful with a particularly strong parmesan kick (albeit lighter on the garlic so wasn’t overpowering). 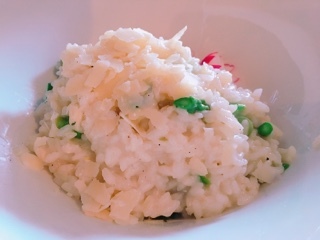 In the mood for a meatless dinner, the asparagus risotto ($18) was a good choice. The rice’s consistency was spot on – incorporating enough broth so it was creamy and not a thick paste, but not oversaturated as to become a stew – and there were sufficient asparagus pieces mixed throughout for crunch. More shaved parmesan would make the dish even better, especially since it was under seasoned (luckily, there was salt at the table so the dish was easily improved). While the brown butter gnocchi ($18) smelt heavenly, the actual pasta was too mushy. 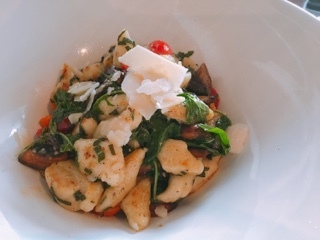 To be fair, the firmness of gnocchi is a debatable preference: some like it doughy and soft (how it’s prepared at Table 21) while others, like me, prefer the dough to have a bit of elasticity, and when there are crispy edges, even better. The brown butter sage sauce was delicious, adding a light sweetness to the gnocchi and paired well with the roasted cremini mushrooms. 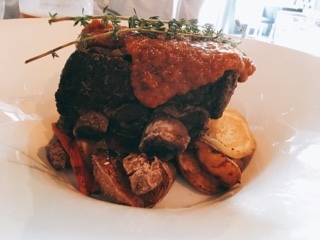 The beef short rib ($29) is a popular choice; we weren’t the only table ordering it. I can see why, the dish is fantastic. The towering bone-in rib doesn’t require a knife having been slow-braised and has a tangy kick from being smothered in a whiskey infused barbeque sauce. On the side, sweet roasted heirloom carrots and rosemary smashed potatoes that have lovely crispy edges, which adds a bit of crunch against the otherwise tender plate. Since my in-laws have just moved to Etobicoke, a whole new slew of neighbourhood restaurants have opened up to the palette. Table 21 is a lovely start: the restaurant’s food is refined but comforting and the laid-back atmosphere a welcoming environment. And next time I entered, there won’t be that sense of déjà vu.